This is the second of the Horse pages. See also, The Horse, pt. 1. In the system of 5 primordial Buddha families, the Southern Buddha is yellow Ratnasambhava (Tib. Rinchen Yungneh,) who holds a jewel. He is seated on a horse-supported throne. The Western Buddha is red Amitabha (Tib. Opameh,) who is associated with the lotus, but one of his emanations is the bodhisattva, Avalokiteshvara, whose wrathful form is associated with the horse. The heruka [fierce protector, Skt. : dharmapala] of the lotus or padma family of Buddhas and bodhisattvas to which Avalokiteshvara (Tib. Chenrezi) belongs, is Tamdrin [pron. Tamzin] (Skt. Hayagriva), the Horse-throated. In English he is more usually called "Horse-necked." He is described as having a stocky human-type body with a horse's head. Hayagriva is considered to embody the speech aspect of all buddhas, so the characteristic high-pitched whinny of a stallion is understood as the cry that is Wisdom. It cuts through illusion and/or false attachments to evoke or reveal the nature of reality which is enlightened mind. As an emanation of Amitabha, Hayagriva's seed syllable is HRI. 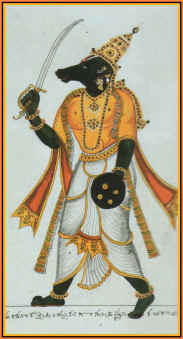 Often Hayagriva is shown as a human being, but with a small horse's head above his human-looking one. In a tangka at the Himalayan Art site, the horse-head is nearly invisible on the crown [top] of this fierce protector's head. Small, dark-green, and facing to our right, it is almost obscured by the flaming hair. Behind that are his iron wings, indicating his heruka nature. In a Nyingma image, we can see 3 horse heads, as we also find in the red Gelugpa 6-armed one (Skt. Krodha Atiguhya = Wrathful Supreme Secret) where the deity also has 3 heads, and in each of his six hands are: a goad, a noose, a club and a sword, along with his lotus emblem and a skull cup. Also, one of Guru Rinpoche Padmasambhava's 25 original disciples, Gyalwa Chöyang, is identifiable in images as the one with a horse-head at the crown of his head. However, in the tale told below of the Horse-lord or Horse-king, Chenresi becomes Valaha, a gigantic horse that can fly through the air. Many examples of Vishnu Hayagriva with Lakshmi, his consort at foot of linked page. An ancient Hayagriva temple at Hajo (Kamrup District) in Assam enshrines this form of Vishnu. Since Buddha Shakyamuni is considered by Vaishnavas to be a manifestation of Vishnu, the spot has long been a center of worship for both Hindus and Buddhists. The Bhagavata Purana (25) that contains the mythology of Vishnu tells us, "At the beginning of the present age, when kings become thieves, the Lord of the Universe will incarnate under the name of Kalki. He will appear seated on a white horse, and holding a sword in his hand, he will cross the sky like a comet. He will re-establish a Golden Age punishing the wicked and comforting the just, then he will destroy the world." A new type of human being will then appear. The history of Tibet called The Mirror of Royal Lineage [Rgyal-rabs gsal-wai me-lon] includes, in chapter 6, the tale corresponding to the Valahasa Jataka, also found in part in a Mongolian translation called the Bodhimor. The Valahasa Jataka or "The Noble Horse-Lord"
When noble Chenresi [Avalokiteshvara] had already helped living beings in many ways, he continued this work by assuming the form of Balaha, [or Valaha] the horse-king, in order to provide an example of how to choose virtue and reject wrong-doing. Once, many not-so-virtuous merchants from south India left for the outer ocean to search for jewels. They had boarded a large vessel with all their necessary equipment, but after a week at sea an unwelcome wind arose and they found themselves in grave danger. At midday a dark cloud like a dense fog obscured the light of the sun and darkness spread all around them. A fearful red wind came up that seemed to shake the very foundations of the earth, so that mighty trees of the forest tumbled. The waves of the sea sprang up like lions, and breakers lashed both sky and land. The merchants took hold of each other, and cried out to their relatives. Though they howled in terrified lamentation weeping bloody tears, helpless and exhausted, their vessel was wrecked. Then the merchants, grabbing on to the timbers, were carried by that unwelcome wind to the island of Singhala [Ceylon or Shri Lanka] which was then the home of rakshasi-s [demonic beings.] There the merchants, calling out to each other by name, came onto dry land. Now when the rakshasis became aware of this, they changed themselves into young, beautiful women and laden with refreshments, they appeared to the merchants and greeted them saying, "Are you all right? Are you hurt?" Charmed by these greetings, and then plied with food and drink, the merchants were taken in by the ruses of the rakshasis. They spent some time there on the beach, but then the rakshasi-s said all together: "You merchants better not go into the upper part of the valley." Then each one of them led a merchant away into her house where they made love and played together, and lived as man and wife. Then a mysterious voice said, "Look at those poor merchants who, suffering from the consequences of their past misdeeds in former kalpas [Skt. for eons], and carried by a contrary wind, have fallen into the clutches of those who have the power to kill them just as a snared animal runs into a net, and they have no means of salvation. Infatuated by desire, they mistake rakshasi-s for goddesses, and, filled with the magical food of illusion, they forget their former misery like a dream, and now their minds are content." Now their captain understood that this was the Island of Rakshasi-s, and in despair he thought, "They are happy now, but how will this end?" Then he remembered the warning of the rakshasi-s and he wondered about the upper valley. So in the night when his own lover had fallen asleep, the captain sneaked out and reaching the upper end of the valley he heard, from within an iron house with no doors, loud wails and cries of misery. Wondering what it could mean, he listened and knew by the language that inside were other merchants from India. He shinnied up the trunk of a nearby tree and called, "Who are you in there? " "We are traders who have lost our way." And to the question, "How long have you been shut up here?" they answered, " Like you, our ship was driven here by an ill wind and we, too, were seduced by the rakshasis. While we were making love with them, you came to this island and so we were put into this cage. Now we are to be eaten up one by one. You, at least, still have a chance to get away, for once you are caged there is no means of escape." The captain repeated, "In truth -- there is no means of escape." They said, "But there is a means of escape. We also thought we must fly, but, clinging to lust, we were retaken. You had better cling to nothing and nobody now and just fly." "If you cross a narrow pass, there on the north side in an expanse of golden sand is a turquoise pond around whose rim is a green meadow. And there, on the evening of the fifteenth day of the month, a moon-beam bearing the very beautiful horse-king Balaha, who can carry a hundred men, will appear. "After the marvelous horse says that, mount without clinging to whatever delights or even any children you may have here. Close your eyes and flee." The captain thought, 'That is what we must do,' and he went back to the house. But when he came to the bed of his wife the rakshasi, she seemed to know all about it for she said, "You perverted merchant, you will ruin your life. For if you direct your thoughts to anything but me, you will perish for sure. Where have you been, Mr. Big Shot?" The merchant lied, "I only went out for a stroll." Later, the captain assembled the young merchants, told them exactly what had happened, and they all agreed to escape. Then on the evening of the fifteenth day, the men slipped some narcotic drugs to the rakshasis, and when they nodded off, their leader guided the young merchants to the upper valley. Once through the narrow pass, they reached the golden sand on its north side where, beside the turquoise water in the emerald meadow, the horse-king Balaha was supposed to appear. After a short while, down from the sky on a moon-beam came the horse-king, glowing like a rainbow. When this marvelous horse had drunk from the turquoise pond, grazed the emerald meadow, and rolled three times on the golden sand finishing it off with a shake, he said in his human voice: "Merchants! All you who are trapped on Rakshasi Island! Hop on my back without a thought for the love of the rakshasis, of your babies, or of any of the fun you have had here. Shut your eyes, and I will take you home to your own land." At this, the leader said: "Great Chief, excellent magic horse, we merchants had set out together for the islands of the ocean to fetch jewels, but because we were not worthy, our great ship was wrecked out at sea by a contrary wind and we ended up on Rakshasi Island. There we were tricked by the evil-doing rakshasis who wanted to kill us. Now that there is no other means of escape for us, we beg the help of the Merciful Horse-lord." Then the captain mounted the horse's shoulders grabbing a-hold of his mane and, while the young merchants mounted behind him, he reminded them, "Remember, do not desire the homes of the rakshasi, their children or the enjoyment you had there. Do not even think of it, and till we have crossed the ocean close your eyes." And the horse-lord carried them up into the sky. When the rakshasis perceived what had happened, they came outside leading their children, and called out, " Can you really forsake these high castle walls, the happy families and the community of husband and wife? Can you just leave behind the children begotten from your own bodies, and the delicious meals, too, you shameless good-for-nothings?" They turned their eyes back, and as they looked, every single one of them except the captain was seized by desire, so they fell to earth. The fallen were seized by the rakshasis who now, throwing off their former beautiful bodies, appeared in true rakshasi form -- with shaggy heads, their breasts drooping from their shoulders -- and baring their fangs, they began to eat them up without a moment's hesitation. When finally the horse-lord had come to the end of the sea, he said to the merchant, "Turn around, look and dismount." The leader of the merchants now opened his eyes and saw that none of the young merchants was on the horse's back, and he was deeply grieved, and said, "O noble horse-king, where are all my young merchants?" And he wept. The noble horse, pawing the earth with his forefoot and also shedding tears, said, " Those young merchants perished, for without the merit that you have, without the memory of life at home in Jambudvipa, and only full of longing for life on the island of evil rakshasis; not remembering their parents and dear friends, and only clinging to the faces of those young rakshasis, they perished. Not remembering their legitimate children, and only clinging to the trick rakshasi-children, they perished. Oh poor, pathetic beings! When those slain pupils of the Vajra-teacher (Buddha) end up in the Avichi hell, what can even a highly merciful lama do for them? "If in growing up, people get distracted and get carried away by a contrary wind, what can parents do, even with great affection? If, not listening to the useful doctrine [Buddha- dharma] the young look behind them and fall, what can even the flying horse-king do? "O merchant, do not weep, but listen: The joy and sorrow of this life is like the illusion of a dream, like visions in the mist, like a lightning-cloud in the sky, therefore do not desire worldly joy." And so the horse-lord explained the doctrine of the Four Truths and carried the chief merchant (when he had dried his tears,) to a hill where he could see his own home. There, the horse-lord leapt into the sky, dissolving like a rainbow. When the chief merchant came to his house, his parents and relatives all assembled and hugging him, they wept with joy. But afterwards the parents and relatives of the young merchants came around crying, "Where is my father? Where is my elder brother? Where is my uncle? Where is my grandson?" They all wept with grief and disappointment. Then the chief merchant called together all the parents and relatives of the young merchants and told them all the details: How they first had entered the sea, how the pernicious red wind had wrecked their ship; how they had been carried by a contrary wind to Rakshasi Island, had married there and begotten children; how they had then found out the truth about the rakshasis and sought a means of escape; how the men of the iron house had taught them how but then, how the young merchants had not listened to the admonitions of the horse-king and fell to earth, and so on. Then he instructed them in the dharma: Since every thing or condition in the realms of existence is changeable, believe in the consequences of deeds (karma.) For whoever persists in clinging to this life when he or she behaves wrongly, will fall just like the young merchants who by looking back had to suffer the consequences and so, had no opportunity of saving themselves from rebirth into miserable states. But those who do not cling to this life having gotten the understanding in their minds of the Dharma, will become buddhas just like the chief merchant after he obtained the happiness of heaven and salvation. ~ edited from Wenzel, H. "A Jataka-Tale from the Tibetan," The Journal of the Royal Asiatic Society of Great Britain and Ireland, pp.503--511. See also, Valahassa Jataka with notes. The name of the great Buddhist preacher-poet, Ashvaghosha, is translated into Chinese as Ma-mi-ne, "voice of the horse." He was a disciple of the Venerable Pârshva, whom Buddhists of the Far East consider the eleventh Indian patriarch. Parshva was from the North, and on arriving in Central India he learned that it had been a long time since the Buddhist clergy of that district dared sound the temple gong. The sounding of the vihara's bell was a privilege only granted to the prevalent religion. The cause of this humiliation (for Buddhists) was the brilliance and erudition of the Brahmin pandit, Ashvagosha, whom no one had managed to refute. It was said that the poet-philosopher had journeyed to Magadha in central India just to challenge the Buddhists in their own stronghold. Many said that his eloquence had magically rendered the bell mute. Parshva was bent not only on debating Ashvaghosha but on converting him, and he proposed that the defeated person become the disciple of the victor. Ashvaghosha accepted, and deferring to the patriarch's age, permitted him to speak first. Parshva surprised the assembly by beginning with a simple question rather than a discourse. He asked, "What do we need to do in order to keep peace in the world, to ensure that the king live long, and to permit the people to enjoy prosperity free from misery and catastrophe?" It is said that Ashvaghosha remained silent for a time, then merely bowed his head in submission to the patriarch. It is unlikely that he was immediately convinced of Parshva's wisdom although the latter had imputed, merely by the posing of his question, that the dharma could provide the conditions for peace, prosperity and happiness. When Ashvaghosha demonstrated his integrity by unconditionally accepting the conditions of the debate, it is reported that Parshva manifested in a series of amazing transformations. Then Ashvaghosha recognized that his new teacher was no ordinary human being, and he joyfully became his student. Parshva later returned to the north, leaving his closest disciple, Punyayashas, to instruct Ashvaghosha. According to Taranatha, later on Ashvaghosha was defeated by Aryadeva in a Vajra contest. Discouraged, he came upon a Buddhist text in which his conversion and destiny had been prophesied by the Buddha, and it was then that he actually joined the Sangha as a shramana. The Chinese legend goes that the king of "Little Yu-chyi" to the northwest invaded Magadha and demanded as tribute the bowls of the Buddha along with the poet, Ashvaghosha. His own nobles objected, saying that their king had set much too high a value on the man. Therefore, in order to convince them of the wisdom of his demands, he took seven fine horses and after having starved them for six days, he led them to the place where Ashvaghosha was teaching. Then he ordered that fodder be given the horses, but they were so moved by the words of the Buddhist preacher that they shed tears and could not, or would not, eat. So that is how Ashvaghosha earned the name, "Voice of a Horse," meaning one from whose teachings even animals, not possessing speech but sensitive to the subtler aspects of language, can hear the Dharma. According to Tibetan folk traditions, when a fine riding horse dies, its skull is sometimes placed on the roof of the owner's house to ensure that the wealth of the household does not disappear with the loss of the animal itself. This action gives popular expression to the idea that a horse – and in particular, a horse's head – embodies wealth, power, and even spiritual attainment. Likewise, when a horse dies in Mustang, its skull is invariably crushed with a rock. This act releases the horse’s consciousness so that it may be reborn, and invites vultures to feed on the corpse. For F. S. Leeds and family, and deceased horses Moon and Easter Lady, and for all animals everywhere.